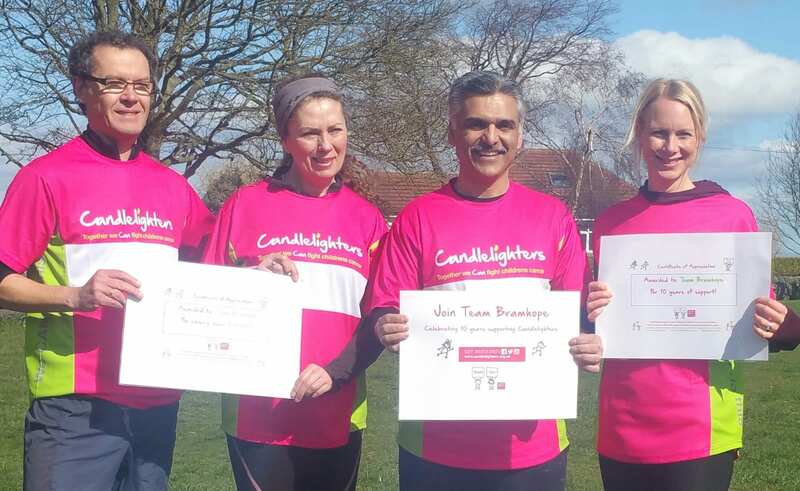 These young people have all done an amazing job raising the awareness and fundraising for Candlelighters over the past year. AJ was the first one to receive his Central Yorkshire Scouts Challenge badge, a special badge developed for fundraising for Candlelighters. He was keen to support us after we supported his family when his brother Oliver was diagnosed with Acute Lymphoblastic Leukaemia last year. AJ actively approached companies to ask for tasty donations and received many generous offerings. 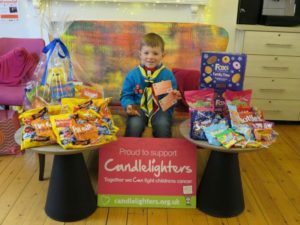 AJ wanted to collect sweets for patients, as sweets in the eyes of a seven year old “make everyone happy.” He has continuously strengthened our relationships with local Asda’s and companies who have continued to donate things for the services side of Candlelighters. He has demonstrated non-stop effort and even managed to get his beavers involved with a long ‘park crawl’, raising over £500 and inviting our team to do an awareness speech. Ewan moved up to high school in September and met his new best friend Cerys. They had been friends for just 8 months when Cerys was diagnosed with cancer. He selflessly organised fundraising to support his friend, cutting off his own hair when he heard she would be losing hers saying, “I just want to make my friend happy”. 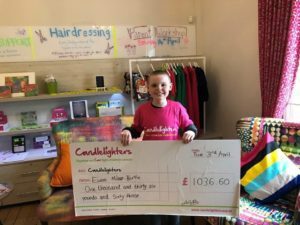 Ewan organised the head shave at his auntie’s hairdressers surrounded by friends and Cerys herself and was relentless in his efforts to raise money to support his friend and others in a similar situation. Ewan also organised some great press coverage, helping to raise awareness across the Hull area and in his school with friends. 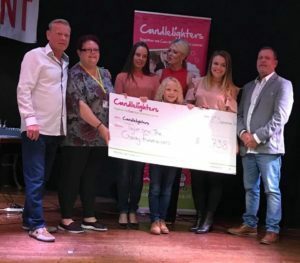 Freddie, Tom and Charlotte wanted to raise money for Candlelighters for their friend Elliott Robinson who received support from Candlelighters and sadly died in March 2018. They stand out because they wanted to do something positive in a heart-breaking situation. During the Christmas holidays in 2017, the trio ‘Swam the Channel’ to raise money. They each swam 21 miles (33.6km) in a local pool over 12 days, with just Christmas Day and Boxing Day off. That is 112 x 25m lengths per day for 12 days or 1,344 lengths each, 4,032 lengths in total!! They collectively raised £14,811.83. The group also got involved with press work in The York Press, as well as joining in the fundraising with school friends at St Olaves School in York. Taylor, a local tennis star, decided he wanted to give back to the community. He optimised on his sporting success and contacts to increase awareness of Candlelighters. Taylor, with the support of family and friends has raised over £5,000. 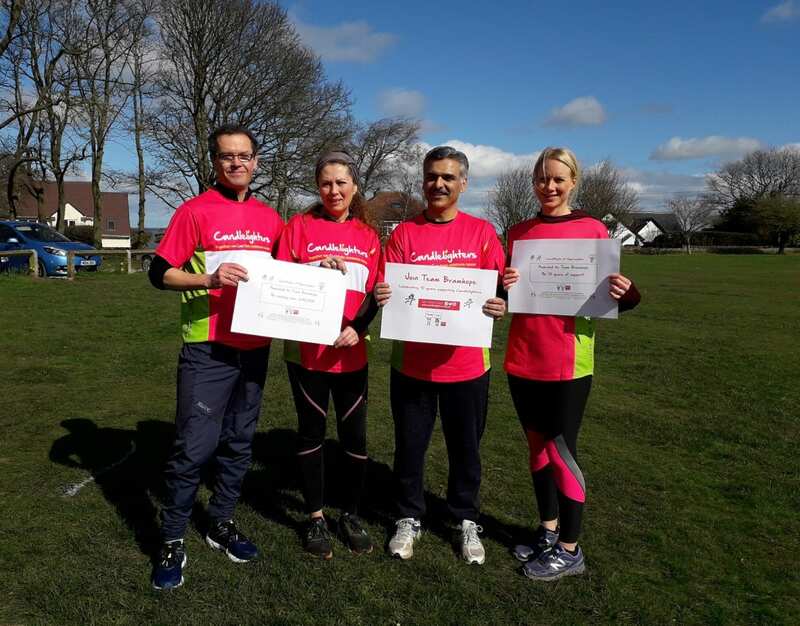 He organised a 1 mile walk last year and again this year, with over 40 participants and promoted this to local schools, getting his wider community involved and engaged. Taylor has increased awareness too, appearing in newspapers and on Leeds Radio stations. Taylor introduced local business men who support his sporting career, to the charity. One contact arranged for 7 Lamborghinis to follow the funeral procession of a young boy, who sadly had passed away from cancer; Lamborghinis were his favourite cars. Taylor wanted everyone to feel appreciated and even held a ‘thank you’ night, with live entertainment for all involved.